Everyone has their own way of working, their own workflow, methods, tools, etc, that said there are some universals. Take thumbnails for instance. For hundreds of years artists have used thumbnails to quickly work out ideas for their drawings and paintings. Thumbnails are great, you can quickly and easily see if something it viable or if it needs changing. You can try many different options with little time loss to determine the best path forward. Because of their size, thumbnails are great to determine if an image will have impact even at a small size. Thumbnails are so important... and I kinda really don't like them and I feel like I am really bad at them. 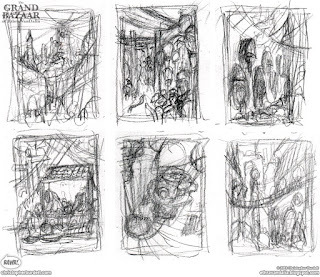 RARE thumbnails for 6 of the first 7 environmental pieces for The Grand Bazaar of Ethra VanDalia. What do all those scribbles mean? This mess will eventually be something... hopefully. To be honest I have an issue with drawing things more than once... I hate it. I like to start something, do it once, take it to completion, and move to the next thing. This is what wrecked my childhood aspirations of being a sequential artist. It is also a bit of an issue when it comes to some of my concept work, when it gets to the tight refining part of working and reworking a design to completion I can get a little burned out and my attention wanes. Same can be said for thumbnails. I want to be drawing the main drawing, not working and reworking thumbnails to get it perfect. This can be a problem for an artist. This has been an issue for me. Sometimes things were not as well planned out, sometimes things could have been a little better with some extra planning. As I have said earlier, everyone has their own workflows and methods and I have worked a long time to create a workflow that addresses my issue with simultaneously needing and hating thumbnails. From the beginning, I like to think about what I want to do. I spend a lot of time and energy working out ideas in my head. I have never really worked my ideas out on paper, even before I realized I did not really like the process. Granted, you can do just so much in your head before you actually need to start making stuff in the real world, but it gets me pretty far and has not steered me too wrong so far. To help with this, I have employed the help of the camera to act out characters, monsters, scenes, etc. to get into the moment and space of the planned art. I physically perform the intended piece of art to further get my head around what I am making AND to get needed reference. Many happy accidents happen along the way and with the help of Dear Wife behind the camera we can quickly and easily determine what is working and not working with poses, actions, foreshortening, etc. I do this with action figures too in my Star Wars work. I build out scenes and dioramas with figures to flesh out the composition rather than sketching out ideas. When there is no real world analog, or I have something concrete in my mind I do go straight into the sketch phase. I guess it can still be called a thumbnail, but I am working digitally at 300 dpi and at the intended final dimensions. That said, I do usually shrink the image down somewhat so I am seeing the whole thing all at once and so I can quickly move across the canvas. I work digitally because of the freedom and speed it offers. I can flip, stretch, delete, duplicate, resize, etc. 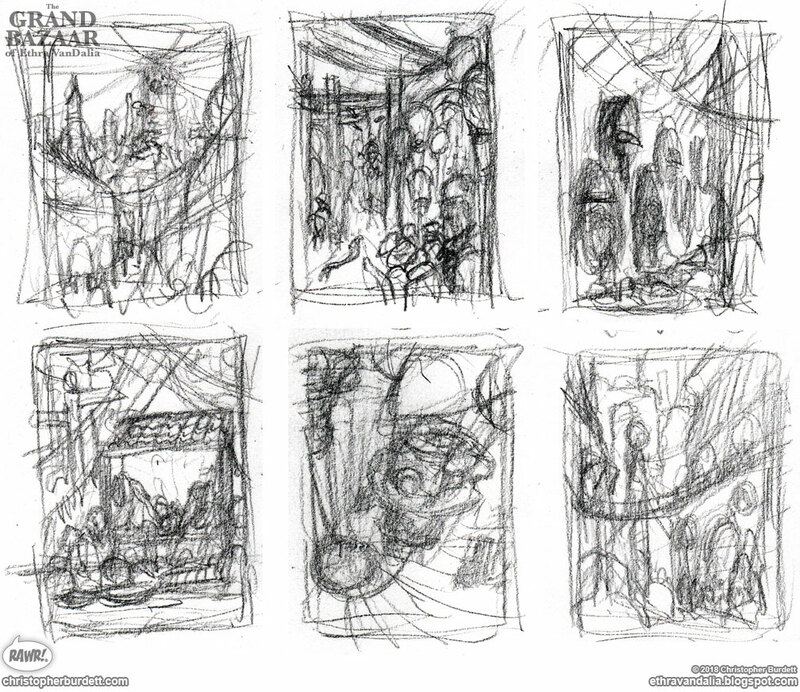 with no effort at all, making the process of working out a thumbnail sketch a very fast and organic processes. When I try doing this traditionally it is a slow frustrating process, because I never get it right the first time around and the least of my problems generally is that I began the sketch too large on the paper. This is an issue that is easily remedied when working digitally. My thumbnail sketches are loose and have only the barest of details which leaves a lot of the fun work to be had in the final drawing. 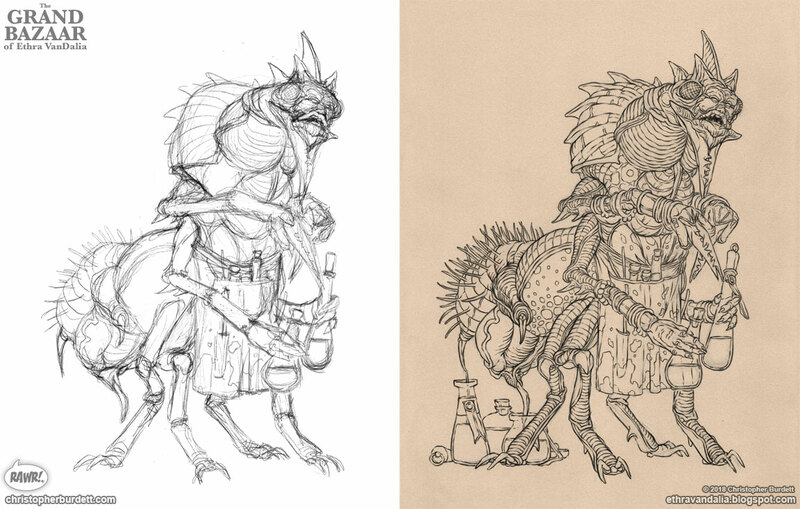 I have mentioned it here before on the blog that when I started working in the gaming industry I was actually so embarrassed by my sketches and thumbnails that I would turn finished drawings in when concepting miniatures. 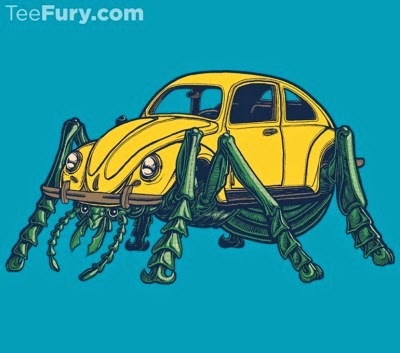 I also kind of did not know I was allowed to just send in thumbnails. No one pointed it out to me... so I just kept sending in fully realized drawings that would then need editing and revising. Eventually, I learned the error of my ways and started sending in thumbnails and concepts for assignments, but it was a tough transitions. Still to this day I do not make thumbnails in the traditional sense... in my opinion. I make rough sketches. 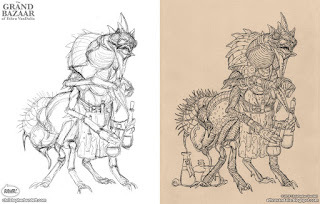 They are more planned out than a thumbnail and you will be able to see a direct connection between rough sketch and the final drawing. This all circles back the the first image on this post... actual tiny pencil sketches of planned pieces of art, a thumbnail if you will. As much as I don't like them, they have their place and their usefulness. After some frustrating starts and stops and a lot of wasted time I decided to work out my ideas on paper in thumbnails to get the large sweeping environmental pieces moving forward. And you know what? It worked. I can address perspective and form extremely quickly and I am not worrying about details and the little stuff. They are doing just what they were always intended to do and be. Silly me... I am still taking the thumbnail and working up a more refined rough sketch that will then be used for the final line work. That part of the process is still there and each step gains more detail and refinement. My methods and workflow are still there... I am just going about it better, with those darn thumbnails. Eye of the Beholder Kickstarter NOW LIVE!